Home » Featured » Bad to the Boil! The BAYOU BOILER can boil an 80qt. to 120qt. pot filled 1/3 with water in 15 to 25 minutes! The BAYOU BOILER is perfect for boiling large quantities of crabs, crawfish, shrimp, lobster, and more! The BAYOU BOILER is great for frying turkeys, fish, shrimp, and even brewing beer! With The BAYOU BOILER, you’ll never run out of fuel in the middle of a boil again! 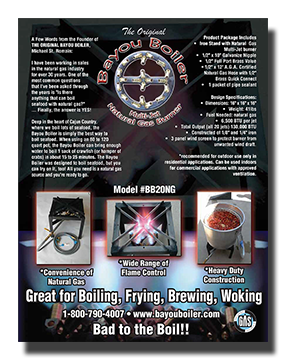 The BAYOU BOILER is the first multi-jet natural gas burner available on the market! Finally, the answer is YES!